The war between Israel and Gaza shifted gears from explosions to psy-ops today when Hamas leader Ismail Haniyeh got himself photographed near the empty lot where his five-story office building stood until it was destroyed to the ground by Israel two days earlier. 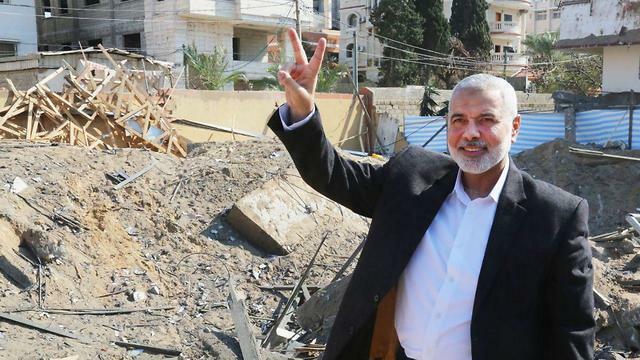 Signaling “V” for victory, Haniyeh promised to rebuild and opined that the “Occupation” has “heard the message” from the “resistance”. He also called for the residents of Gaza to participate in the one year anniversary to the “march of return” border riots this Friday by rioting yet again. There is no question that Haniyeh’s defiance is triggering to many Israelis who wish to see him go the way of his predecessors and not live out his days. Reality though, one that is well known to his own constituents, is rather different. In this round of limited scope warfare Hamas was enjoined by the Egyptians with whom they must maintain an open border and by the Qataries who pay their salaries from escalating the conflict. As a result, Hamas rocket fore on Israel was minor to say the least. Israel, while careful not to exact human casualties, did cause significant damage to Hamas installations, damage that will take many months and tens of millions of dollars to fix. Replying to Haniyeh, a highly placed source within the IDF suggested that he “focus on looking for some new office space” rather than making ridiculous proclamations. The real question remains whether Haniyeh’s performance for the cameras signals the end of the current round and thus only limited-scope rioting on Friday, or quite the opposite and is designed to encourage Israel to be more complacent than it otherwise would be in the face of an unusually large attempt to breach the border fence and force Israel to inflict significant casualties on the Gazans who rush the border fences. Time will tell.